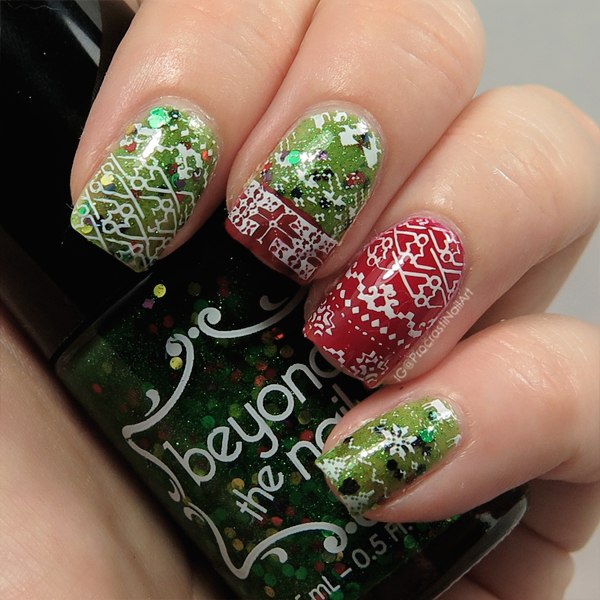 Ugly sweater nails are a Christmas staple in the blogging world, but would you believe I've never done them before?! This year to make sure I was prepared I ordered a few different stamping plates with sweater-appropriate designs on them, though this was the only one that arrived in time to use for this week. It was fun, and I got to use one of my new indie polishes from Beyond the Nail, too! 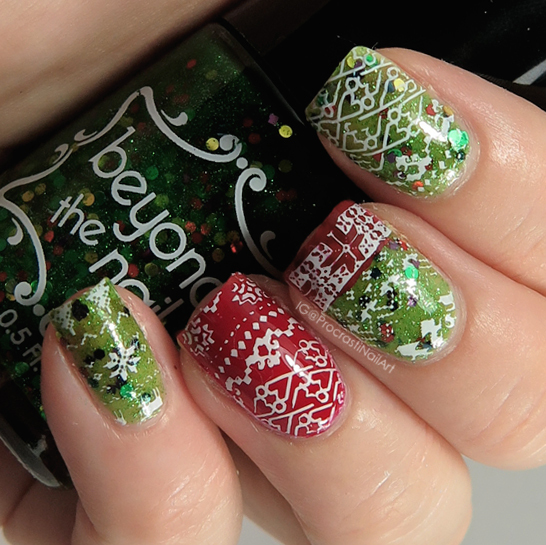 My main base was Beyond the Nail Wreath from their just-released Christmas 2016 Collection. :) For some contrast I added a bit of red with OPI Over & Over A-Gwen and then did some stamping with Mundo de Unas White and BP-L018 plate from Born Pretty Store! I love how the glitter from the crelly comes through the stamping, the little sparkles of red and gold bring it all together. :) Maybe it's not the ugliest of sweaters (would I wear it irl? Hells yes!) but it definitely fits for my Christmas-y December theme. What do you think, is this a sweater you would wear or is it def in the ugly sweater category for you? The stamping is super cute. I love seeing ugly sweater nails too. What a wonderfully obnoxious sweater mani!! I love it. Super cute! I'm obsessed with sweater nails. I love your sweaters nails! That green glitter makes such a great base for them! Aww I love these!! The print is so cute! Ugly sweaters are the only redeeming thing about the Christmas season.